The Dalemain weekend included a stay at Best Western Shap Wells Hotel and an opportunity to watch red squirrels. Aysgarth Run proved to be a big hit this year as it attracted many from the York area as well as friends from as far north as Berwick. And so 47 people in 24 cars converged on the Aysgarth Falls Hotel for Sunday lunch on April 6. Steve Swann, who runs the hotel with his wife Heather, assisted with car parking but the wet conditions in the field led to him closing the access. The organiser of the event, David Pointon (in the red shirt) ended up with muddy trousers before we even got into the hotel. And as Brian Green’s photos show, he and others had some pushing to do to get one car on the move again after dinner. All that, plus the quiz provided by David, made this a memorable start to this year’s season of club events. On Sunday, July 6, 2014, club members made their first visit to Northumbria MG club’s Classics in Corbridge– and were very impressed. Besides the live music, dog shows and also an exhibition of the Hornpipe there was a fine display of vintage, veteran and class vehicles of all makes – and a great variety of modern cars as well. The informality made it even more enjoyable. Our club was allotted ample space on the edge of the event which made it possible for members to relax, enjoy the sunshine, and amble around the other vehicles as and when they wanted to. And many came to visit us. Malcolm Young from Seaburn, Sunderland rode to us on a Coventry Tricycle that he built several years ago. This is a replica of the model built in the 1880s. 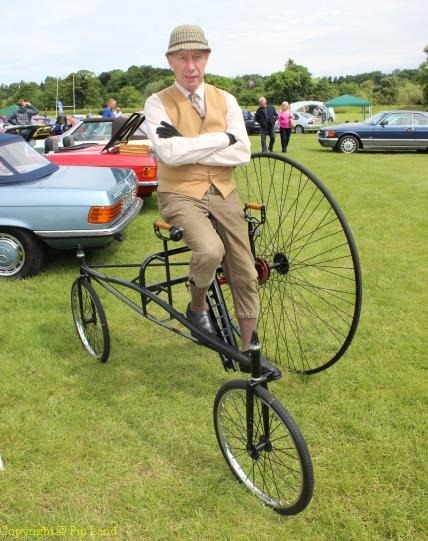 Malcolm explained that he had started by building some replica Penny Farthing bikes and then took on the challenge of constructing the tricycle. He finds the latter a lot more comfortable to ride! It was good to see how many local charities had benefitted from the fundraising at this annual event. The Cumbria Classic Car weekend in mid August provided another great opportunity for some members from the North East and Cumbria to enjoy a night at the Best Western Shap Wells Hotel before swelling the ranks of those at Dalemain on the Sunday. In the bar we had a great time catching up with old friends and making new ones. The hotel staff took very good care of us especially during supper time when most of our group praised the food. Sometime I would love to return to that hotel just to enjoy the walks in Cumbrian Fells. Next morning after a good breakfast we were off to Dalemain and soon were part of a cavalcade of interesting cars, ancient and modern, on their way to the annual classic car show so well organised by Wigton Motor Club. It turned out to be a day of sunshine and showers. 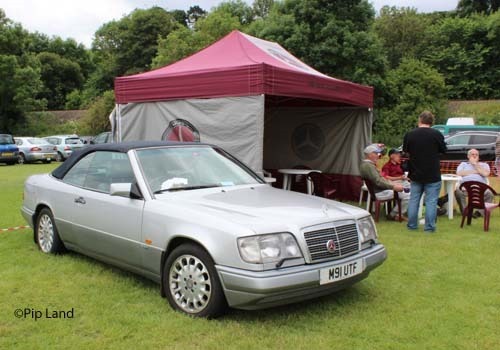 Sometimes the 30 Mercedes-Benz members were sheltering from the rain in the marquee provided by our club and at other times they were sunbathing! As usual club members provided a feast of food for the bring and share lunch. Left: David Pointon sheltering from the rain outside the Mercedes-Benz club marquee. Click on this to see more photos. Our attempts to visit the other cars at the show without getting wet were not always successful. The carefully polished cars provided very different photo opportunities to those expected! Many visited the Mercedes-Benz display with cars ranging from David Gray’s 230SL Pagoda to Howard Graham’s SLS AMG Gullwing. David Gray won the trophy for the Mercedes-Benz club member whose car gained the most votes from other club members. 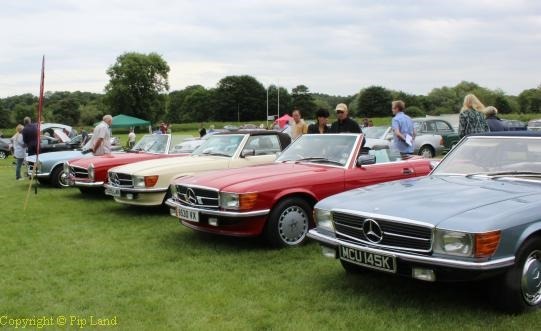 Our thanks to Paul Jobling for organising such an enjoyable weekend for members of the Mercedes-Benz club. Club members attended two very enjoyable if very different events in late September, the first being the Whitley Bay Classic Car Show and then the NECPWA end of season rally at Beamish open-air museum near Stanley, Co Durham. That at Whitley Bay was memorable for being so open to the general public. It was great to see so many families enjoying a Sunday afternoon stroll among about 300 cars of various ‘vintages’. Below: from left – event organiser Malcolm Henderson, and N E Mercedes-club members Giles Brown and Bernie Surtees. To see more photos of the cars at the show click on this picture. The youngest car there would most certainly have been the Mercedes 363 AMG loaned by Newcastle Dealership and driven very carefully to the show by N E Mercedes-Benz club official, Giles Brown. I’m not sure which would have been the oldest but those dating back to the 1930s included a 1931 Lanchester 10, a 17 HP 1935 Siddeley Armstrong and Tony Windler’s “Freda” – a 1938 Austin Big 7 of which only 20 are still on the road. And Ray Storey rode in on an even older classic – a 1929 bicycle which he had restored. In the Mercedes line-up alongside that AMG was Abraham Samuel’s Ponton, Bill Weatherspoon’s 1972 350SL and Albert Gurteen’s Pagoda. There were a few other Mercedes hidden among Austins, Morris Minors, Lancias, Jaguars and Corvettes – and a 1969 Daimler DS420 Limousine. This was the first time the event has been held on the Links overlooking the sea and the entertainment included free rides on classic buses and live music. We were certainly pleased that the N E Mercedes-Benz club had been invited by North Tyneside Council – and plan to return next year. The following Sunday over 34 club members gathered at the annual NECPWA (North of England Classic and Pre War Automobiles) rally at the Beamish museum. This is becoming a very popular event not just for club members but also for those visiting the museum with many more taking time to visit the car rally. This year our friends Pat and Ken accompanied us to the rally and had a great time at the museum. David’s objective this time was to visit the Waggonway and the Georgian House (Pockerley Old Hall)- plus riding on those lovely trams. The Old Hall, built in the 1700s, was interesting but I was even more fascinated by the strong house to which it was attached. That was built in the 1440s with 1.5 m walls to provide protection from the groups of Reivers who were raiding and pillaging along the Anglo-Scottish border at that time, or from the armies involved in the Anglo-Scottish wars. 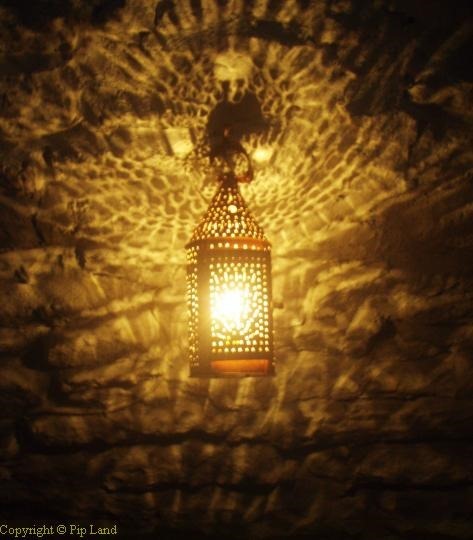 Left – lantern light in the strong house. From the well-kept gardens of the Old Hall we could look across the fields to the newly ‘installed’ church of St Helen’s which has been saved from demolition at Eston in Teesside and to the Waggonway and Puffing Billy. The volunteers at the Waggonway that day were happy to explain how the engine (a replica of that built by Willian Hedley in 1813) worked – and carefully locked us in the carriages so that we wouldn’t fall out during the very short ride. 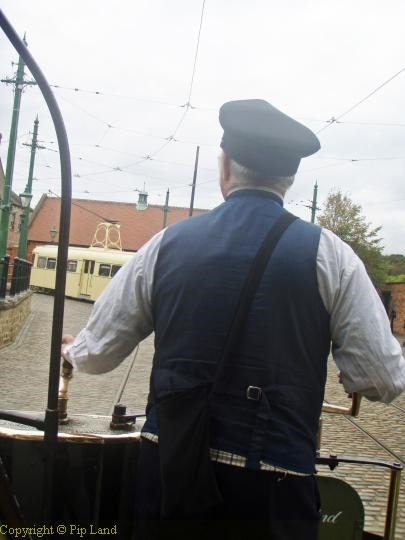 We then took the tram to Beamish village, bought some traditional sweets, and headed back to David’s car which was, by then, very much on its lonesome for most of the other club members had gone home. Our last event of the year was the club’s Christmas dinner.